Frank H. Monroe provides air conditioning and heater repair, service, installation and services in Floyds Knobs Indiana and surrounding areas. Absolutely terrific service !!! Same day !!! A/C water leak...called..Luke was here in about 3 hours!! Wow !! Luke is such a great guy & so knowledgeable....service was great & price so reasonable!!! Thank you Luke &,Frank Monroe Heating and Cooling!!! Servicing an air conditioner in Floyd’s Knobs Indiana! 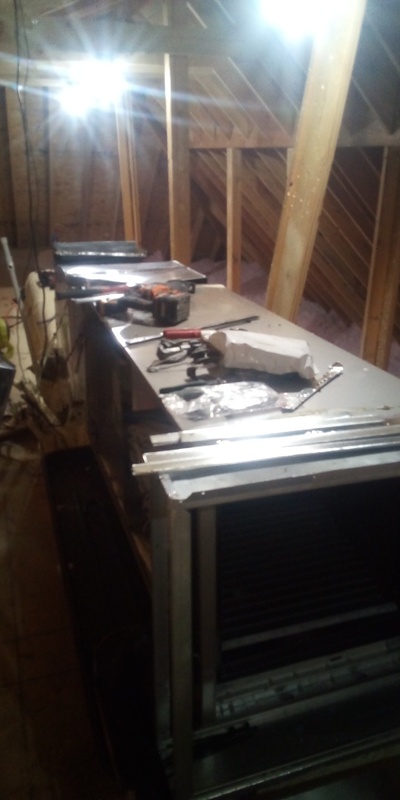 Reworking air handler inattic Matt s house. We’re here to repairs customer air conditioning. Floyds Knobs Indiana. We’re here to repair customers air conditioner. Floyds Knobs Indiana. We’re here to repair customers air conditioning. Floyds Knobs Indiana. We’re here to repair customers condensate leak. Floyds Knobs Indiana. We’re here to service customers air conditioner. Floyds Knobs Indiana. We’re here to service customers air conditioners. Floyds Knobs Indiana. We’re here to service customers furnaces. Floyds Knobs Indiana. We’re here to repair customers zone system. Floyds Knobs Indiana. We’re here to repair customers furnace. Floyds Knobs Indiana. Here in Floyds Knobs, IN on Old Hill Rd. Installing a new High Efficiency has furnace. Installing a new Mitsubishi Ductless Split air conditioner here in the Woods of Lafayette, Floyds Knobs, IN. Putting finishing touches on the new Chillburger. Installing 2 heating and cooling roof-top units. Can't wait to have our first burger! Lafollette Station in Floyds Knobs, IN.